Starting in 2017, the FedEx Oakland hub will mix up our first supply of alternative jet fuel. Half Jet A/half biofuel, the first six million gallons will be blended on site, meeting current aviation regulations and ultimately producing at least 48 million gallons over the term. You may have heard about the diverse ingredients used to produce these fuels – algae, tree pulp, even scrub brush. But this is just the beginning of the story. Early offtake agreements, like ours with Red Rock Biofuels, signal the start of a new industry. One that has the potential to help farmers and start-ups around the world turn waste into new forms of clean energy with some surprising ripple effects. Take Red Rock. Their model uses waste woody biomass (branches, bark or pine needles) from timber operations and a saw mill in Lakeview, Oregon. At the local level, Red Rock anticipates that their biofuel refinery will create about 100 jobs – 30 at the plant and about 70 in woods and transport. These smaller scale facilities are perfect for communities like Lakeview, allowing them to grow with the market as production is increased. At the regional level, Red Rock, the USDA, the Forestry Service, and NGOs work together to better manage forestry health. Harvesting timber inevitably leaves unused material behind in the forest. This waste, coupled with natural waste generated by the forest itself, equates to thermal mass that significantly adds to the risk for forest fires started by man or nature. Also, there is a problem with a nasty South American beetle infestation killing trees. The Forestry Service estimates at least half the trees west of the Rockies suffer from “beetle kill,” creating even more risk for fire damage. 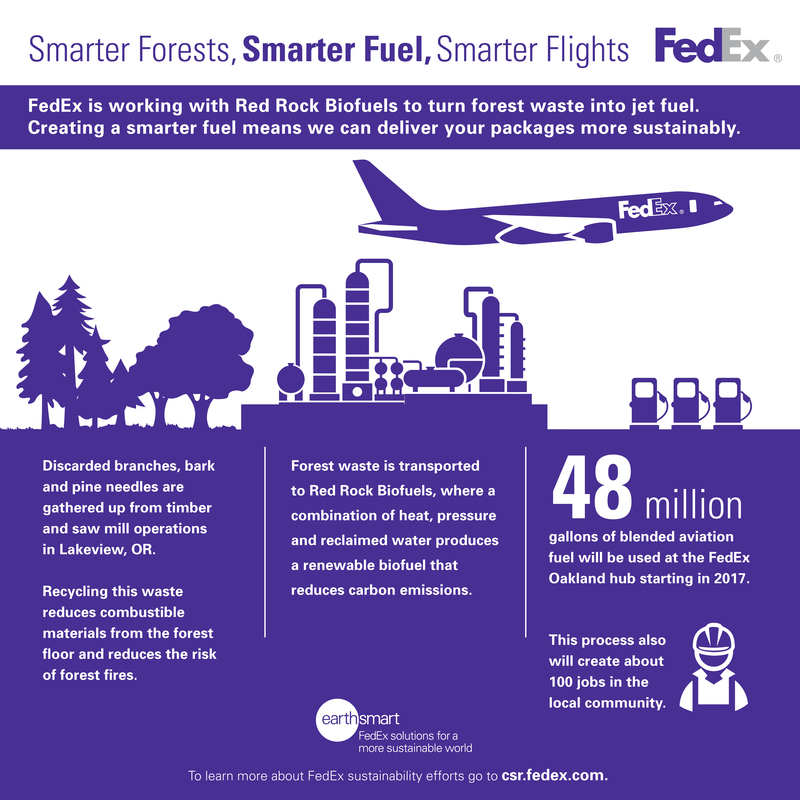 At the global level, turning timber waste into fuel helps FedEx reduce carbon emissions and deliver your packages more sustainably. Models like these also create an interesting possible path forward for FedEx to deliver more to communities and give back. We travel to airports all over the world. Helping others replicate this in a waste-to-biofuel model seeds new industries around these airports. The synthetic renewable crude produced could also be used for chemicals, pharmaceutics, plastics, and heating oil. So one area’s waste and one flight could grow into a sustainable local industry and could create a variety of products and jobs in these communities. This industry is still in its infancy, but with the help of government-backed research grants and loans, the barriers of the past few years are eroding. More companies are solving their “scale-up” issues and becoming cost competitive. Exploring waste as a business model opens up a whole new route of possibilities. FedEx also is looking at alternative fuel companies that utilize waste oils like fats and greases, agricultural waste such as stover that remains after the food portions have been harvested, municipal solid waste, natural gas, and algae, to name a few. As this industry continues to transition from the laboratory to competitive alternative fuels, we can expect to see more aviation industry announcements in the coming years!